This enterprising couple don’t just want to create a green future for their family – they want to create a sustainable lifestyle for their whole community. 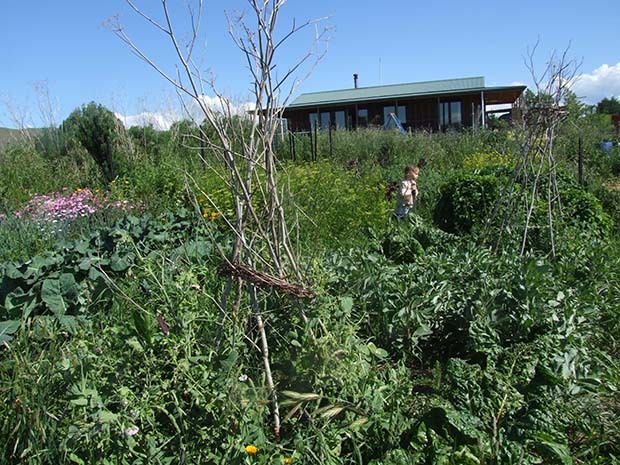 If you don’t know about the principles of permaculture design then Jo and Aaron Duff’s block probably looks a bit strange: there are few fences, lots of untamed vegetation and some strange-looking earthworks. But it’s all part of the permaculture design philosophy that is at the heart of their block, where everything will grow to support and nurture everything else, mimicking what would happen in nature. The idea is to create a landscape that is self-sustaining, able to feed its people and its wider community with no inputs, other than what it creates itself. 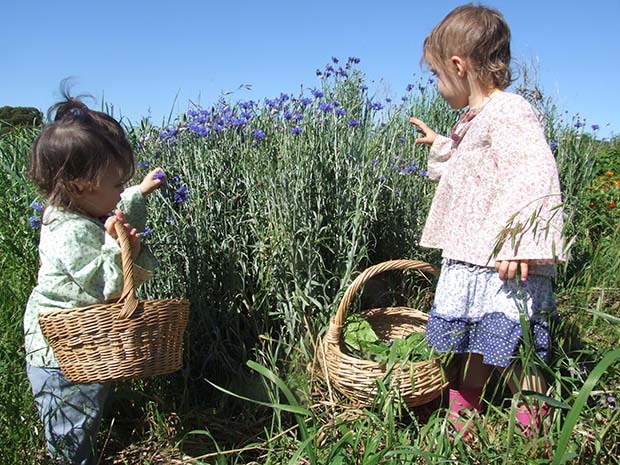 Eliza (left) and Anna pick cornflowers to go in their salad for dinner. The mixed plantings on the Duff’s block are a good example. There are no monocultures in permaculture, and ideally every plant should have multiple roles so there’s a nitrogen-fixing tree like tagasaste (Chamaecytisus palmensis, tree lucerne) that provides fertility to the soil, excellent shelter, great fodder for livestock in times of drought and its abundant flowers feed bees and birds. Within the sheltering arms of the tagasaste are slower-growing trees like the apples that have been carefully grafted onto hardy rootstocks. These will eventually outgrow the tagasaste (which is fairly short-lived at 10-15 years) to provide fruit, shelter for other smaller plants beneath it, and even possibly a physical framework for climbing plants like passionfruit or grapes. 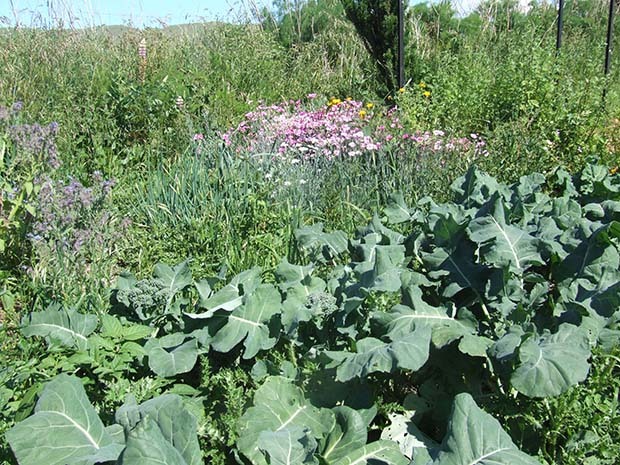 Permaculture is a philosophy of working with, rather than against nature; of protracted and thoughtful observation rather than protracted and thoughtless labour; and of looking at plants and animals in all their functions, rather than treating any area as a single project system. Another fundamental of permaculture is to design to your particular environment after careful observation. When Jo and Aaron bought their block it was three paddocks with two low-lying areas on either side of a gently-sloping hill. Learning how the land and climate make their way through the seasons is important, especially in a region where rainfall is just 750mm a year on a block with clay soil. Permaculture teachings advise people to wait a year before beginning to make adjustments to the landscape, but Jo and Aaron could see one project they could get started on straight away. Anna in the family vegetable garden. In the foreground are teepees for the beans made out of fennel stalks and old grape vine prunings. 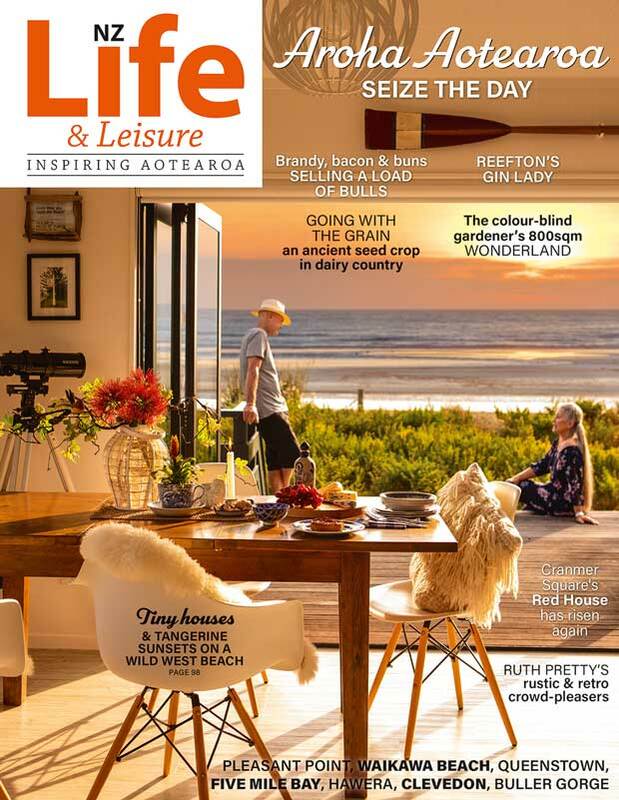 “This whole valley would have been all kahikatea (Dacrycarpus dacrydioides) once – that’s where our farm gets its name – a few kilometres down the road is a huge lake and the other way is a huge wetland area and we’re by the stream that runs between the two so it was immediately clear we wanted (the lower areas) to be wetlands. ¦ To create a healthy, integrated, harmonious farm based on the “whole farm” principle of self-sufficiency, nutrient cycling, minimal external inputs and zero waste. ¦ To nurture the soil as the key foundation for the farm’s wellbeing. ¦ To be as self-sufficient as possible in food and resources for their physical needs, (eg water, energy, building materials). ¦ To provide nutritious food for extended family, friends and the local community. An engineer marked out the contour lines that the swales should follow. Other aims included creating a retreat that would provide for their (and others’) spiritual needs, to use native plants to create biodiversity, to use exotics where they would have no adverse impact, to recycle, to always learn, and to provide themselves and hopefully others with the “right (ie, fair) livelihood”. Some things took a bit of guesswork in the first four years. 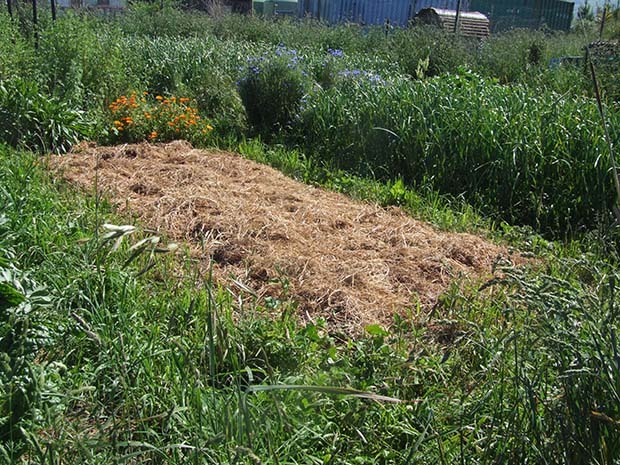 Permaculture advises that you start with the small areas right outside your doorstep to provide your daily vegetables (zone 1) and herbs, then gradually work your way outwards. Instead, they planted up the wetland areas and had to put in a driveway. A contractor digging the swales. Dirt was placed on the downhill side to slow water running through the landscape. 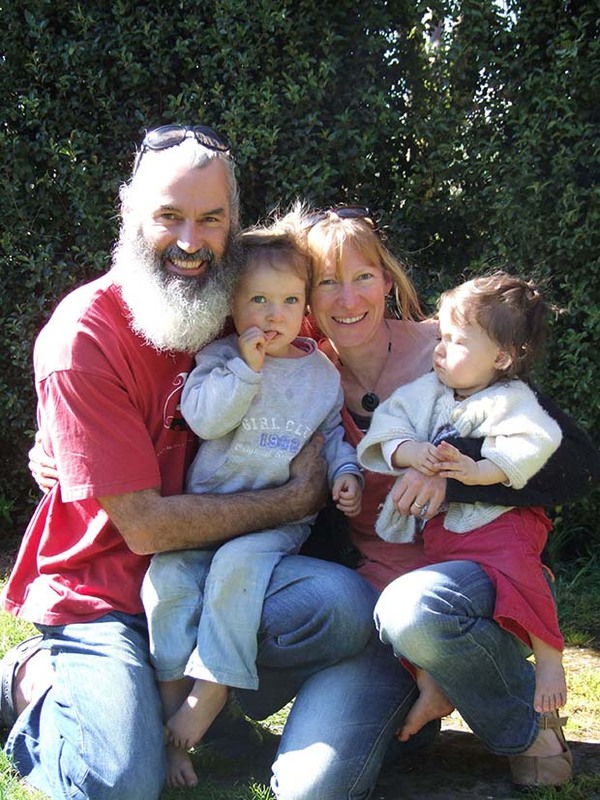 By the time Jo and Aaron – with help from the wwoofers who stay with them – are finished the plan is that you won’t see a blade of grass on Kahikatea Farm, although that is a goal for the long-term as time and finances permit says Jo. 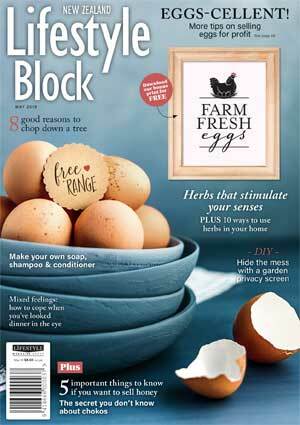 Eventually about half the block will be a ‘food forest’ or ‘multi-storey farm’. A canopy of trees – nitrogen-fixing and firewood options – will form a canopy, and other food-bearing crops from tree crops to berries to vegetables will grow underneath and in clearings, forming up to seven layers of edible plants. Most things will be self-sown and able to survive on the low rainfall due to natural mulch formation and lots of plant cover. 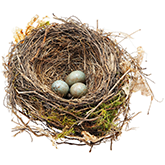 It will also be a complex habitat for birds and insects, self-fertile thanks to the nitrogen-fixing trees and natural composting processes, and highly productive all year round. The forest will also provide firewood, medicinal herbs and plants for creating dyes. Aaron and Anna sitting on one of the completed swales. One of the first ways to start this type of project is with a hedgerow, which the Duffs wanted primarily for shelter. “That’s one of the first things we planted,” says Jo. “It’s a mixture of plants: at tree size we’ve got crabapples and cherry plums, and when they get up (in height) they’ll need something underneath like flaxes and we’ve got shrubs like hebes, eleagnus – a nitrogen-fixer, depending on the species. We ended up with some variegated ones from a garden centre, we couldn’t find anything else so we thought we’d give it a go. Two years ago the Duffs got a business opportunity that fitted in perfectly with their aims and visions, supplying seedlings to an organic shop. They were already supplying organic store Cornucopia in Hastings with vegetables and microgreens for Taste, a local organic café. The Duffs’ stand at the Otane market. 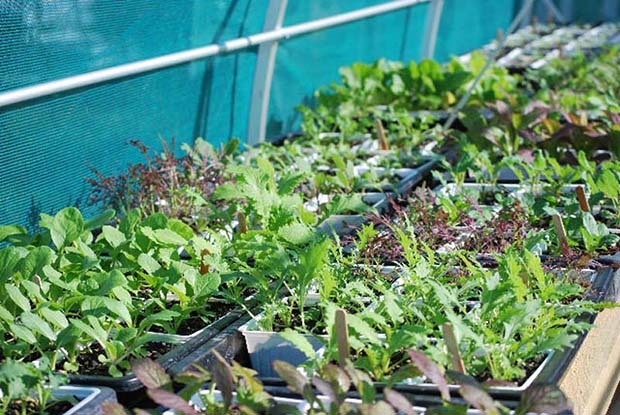 “The seedlings is the main thing and we didn’t ever anticipate doing something like that so it blew our (permaculture) planning out while we set up the infrastructure for the nursery. We’ve got over a hundred different types of vegetable seedlings and herbs in two polytunnels and three shade houses and we’re about to add one more of each. 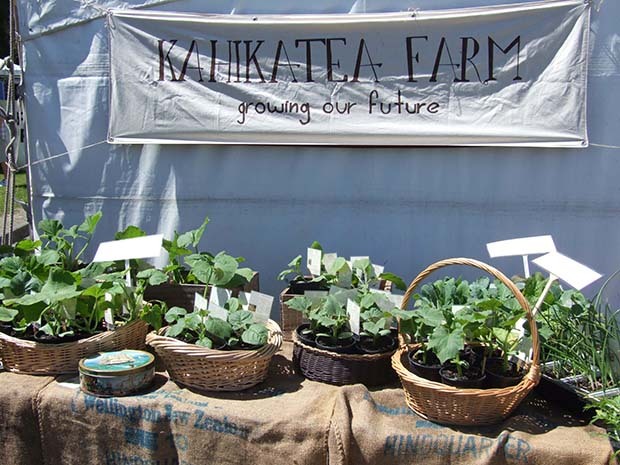 The Duffs sell their plants to several other shops and at the local Otane market on a Sunday. Jo says they’re also considering eventually having farm sales. “We’re just doing a bit of consolidation, beautify it a bit, especially where you first drive in so it will look a bit nicer. Wwoofers (usually international visitors, who volunteer to work on organic properties in return for board) help out with some of the work, and it’s very satisfying to Jo to be able to share their property and teach people too. Aaron and Jo are also expanding their nursery business to provide a wider range of plants for people who want to grow a variety of food but who only have a small garden. The different features of their business all contribute to the family income, and Jo says they appreciate having that variation. 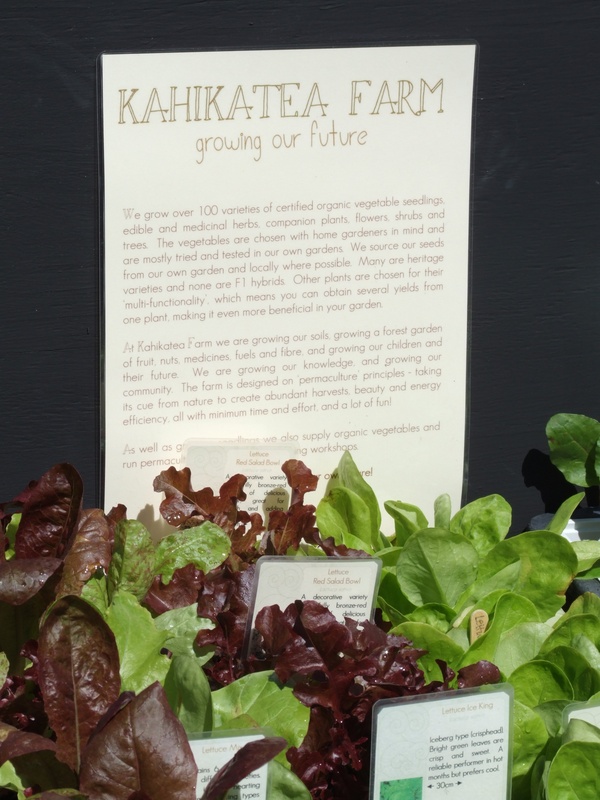 “We supply a cafe called Taste Organic Café with salad mix and Cornucopia with salad mix, stir fry mix and some bulk things like red and spring onions, garlic, beetroot and Maori potatoes, a few herbs. It’s all very small-scale. 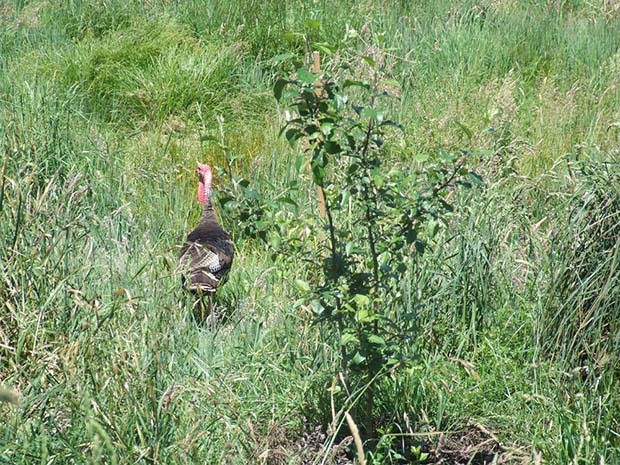 Wild turkeys assist by adding fertiliser. Their own personal garden is still coming together since the house was only completed in 2010, but it already produces enough veges that they can store, bottle or freeze many crops. Jo originally had beds for annuals around the verandah but they were quickly taken over as beds by their two big pet dogs. Everything the Duffs grow for sale is from open-pollinated seeds, saved from their own garden where possible. “The corn seedlings we sell are not hybrids (F1), the only corn we sell is from Koanga Gardens. For two people who lived in a caravan for four years, their house wasn’t much of a priority until baby Anna was on the way. “We originally wanted to build a straw bale house and we were in negotiations with council for a couple of years but they wanted certain things that we didn’t want, like lots of steel, and chickenwire and cement plaster but we refused to compromise on all that stuff. “When Anna was on the way we decided something was better than nothing so we ended up with a small board and batten house and we’ve just done as much ‘eco’ stuff as we can. We made our own plaster and paints, we’ve got a composting toilet, a greywater recycling system, a wood stove that heats the home and water and food. The house is 63m² but add in the covered verandah all the way round and its 80m² in total. It’s also off the grid, running on solar power. 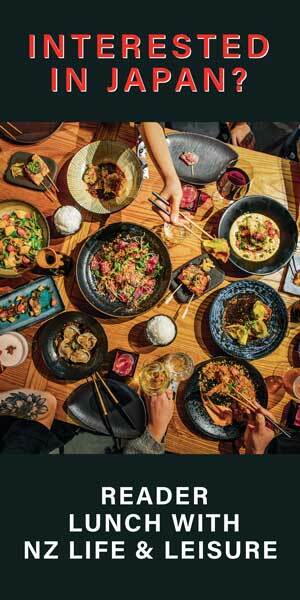 “We always wanted to be on solar power and have always been very conscious of our useage. We had two solar panels (when living in the caravan) but we ramped it up for the house and ended up with more power than we need so we’re able to run our bore pump and we can even plug in the hot water cylinder if we need to (top it up). Going off-grid wasn’t just a philosophical decision. Financially, it was going to cost about the same to run power cables from the road to the house, and that made it an even easier decision says Jo. Although they have a bore, there is also 50,000 litres of water storage in two tanks, with rainwater harvested from the house roof and from their sheds to make sure they always have a good water supply. 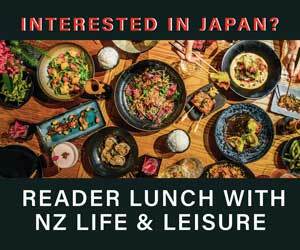 When Aaron and Jo first got together, he was a country-born Kiwi who was working long hours in IT and she was an English-born city dweller who’d always hankered after a rural life. Now they’re living what a lot of people consider the good life but Jo says they’re not into self-sufficiency for themselves. It all seems like a lot of work that could easily get on top of you, but Jo says she never sees any of it as depressing or too much to cope with. The Duffs’ block is clay soil in a low rainfall zone so utilising every drop of rainwater that falls for as long as possible is vital. 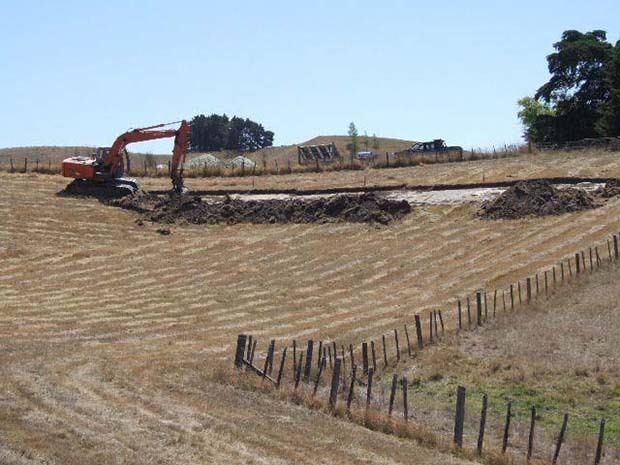 In permaculture – which originated in Australia – swales (or ditches) are dug along contour lines on slopes to slow water as it falls through the landscape by spreading it horizontally. Trees and other plants are put in on the downside slope to soak up as much moisture as possible. It’s an experiment in progress on their farm says Jo. 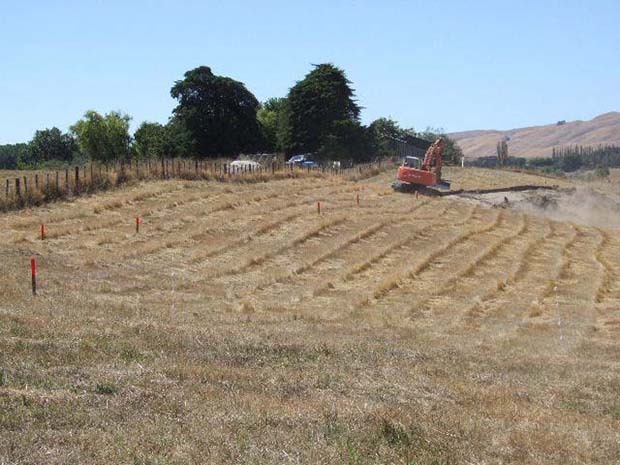 “We did some earthworks, put in swales and ponds in different places, all in low-lying spots. 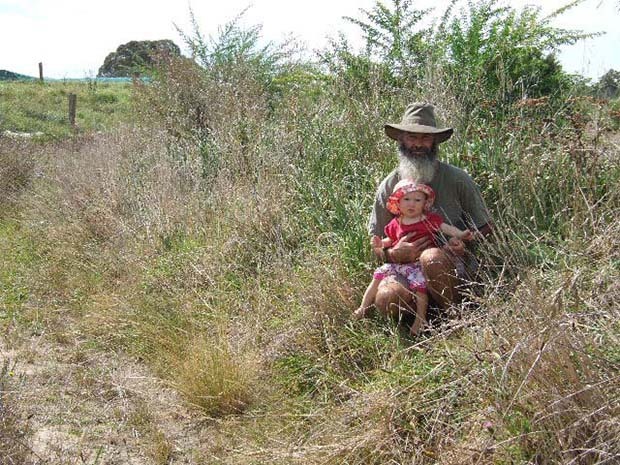 The swales currently have tagasaste and fruit trees planted on the downward slopes and eventually they will form part of the Duffs’ food forest as different micro-climates form. “On the east side we’ve got pears and plums and apples, then lower down we’ve got another little swale and we’ve got pears and quince as they tolerate having wetter feet. In Australia, the soil is worked into swales in winter and then sown, but that wasn’t possible on the Duffs’ block: the wet clay in winter was too soft for a digger to work on, so they had to wait until summer, which then meant sowing couldn’t be done because it was too dry and hot. That has caused some unique issues for their particular brand of permaculture says Jo.